The tomatoes have finally succumbed to the heat and turned an unappealing flaky brown. Before shriveling up they put on a pretty good show of about 14 lbs from 2 plants for 2 months. This was with only one round of fertilizer and spotty-at-best watering. 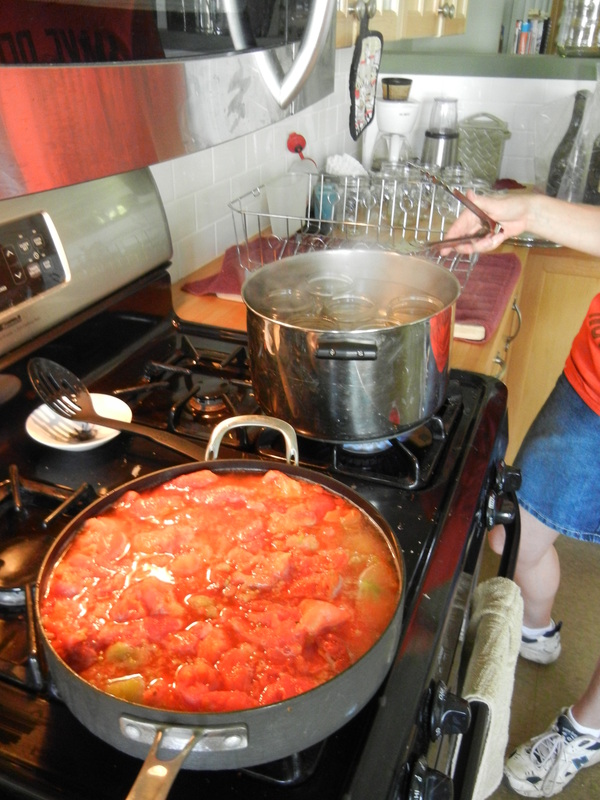 My friend/neighbor/mentor Denise came over and helped me process these 14 lbs of tomatoes into jars of sauce. We both learned a number of things during the process that in hindsight were definite rookie mistakes but valuable learning opportunities none the less. 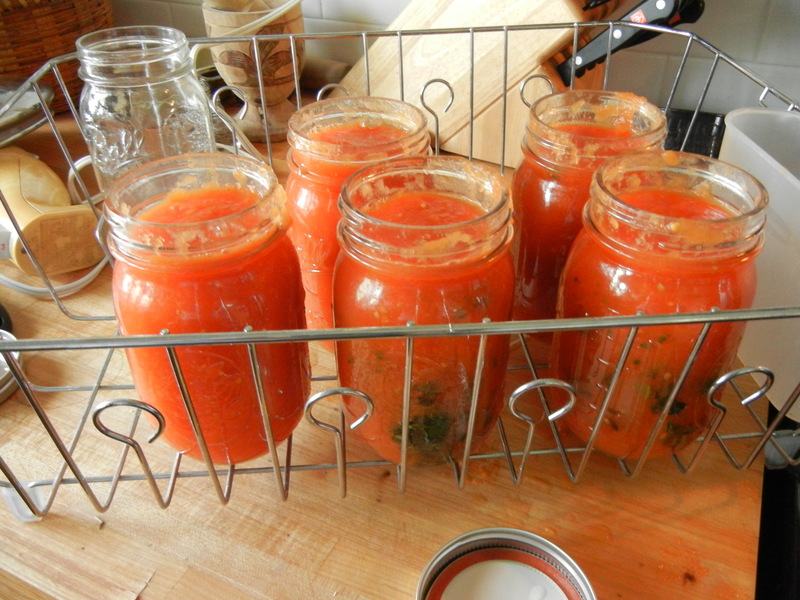 First mistake: Freezing the tomatoes whole without de-seeding them first. 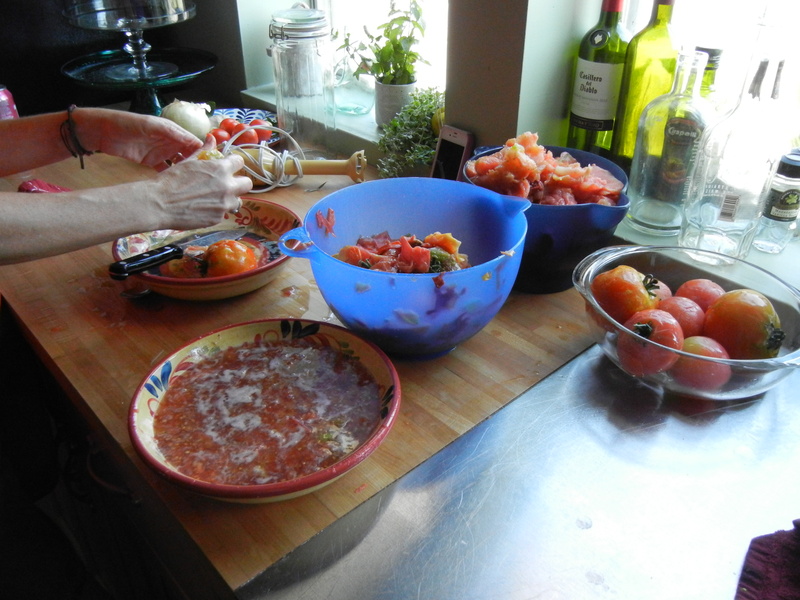 Not only was it incredibly uncomfortable handling frozen tomatoes (despite defrosting attempts), but we lost a considerable amount of tomato mass when trying to separate the seeds when they were still a part of the tomato slushie. 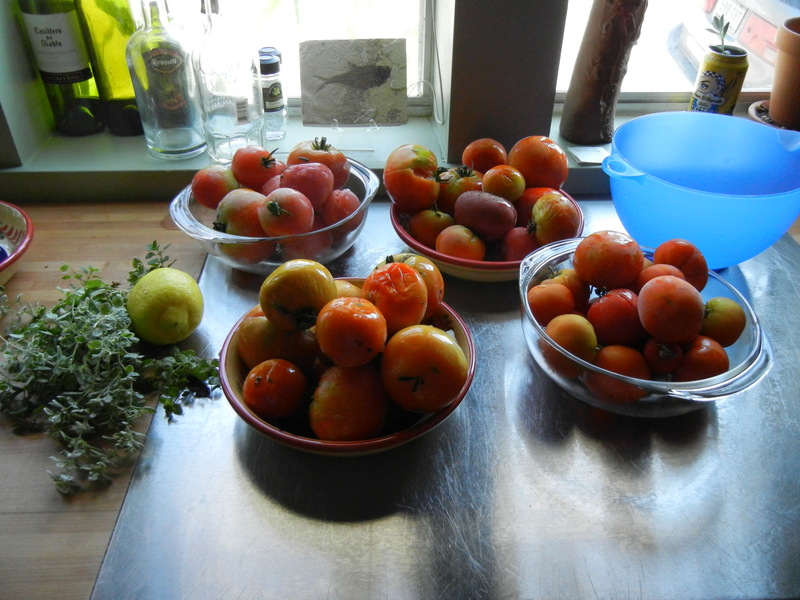 Next time, I will definitely peel, seed, and quarter the tomatoes as I harvest and then freeze them. It may seem super obvious to y’all but I thought I was saving myself time. I did save the tomato guts to try and preserve some seeds. The process worked just fine until I moved the stinky fermenting bowl outside to get rid of the smell. The typical Texas heat combined with our convection oven of a patio turned my fermenting bowl of seeds and tomato guts into a crispy tomato seed chip. I dumped its remains in the compost and will be only a little surprised if I have a mountain of tomatoes in the fall. 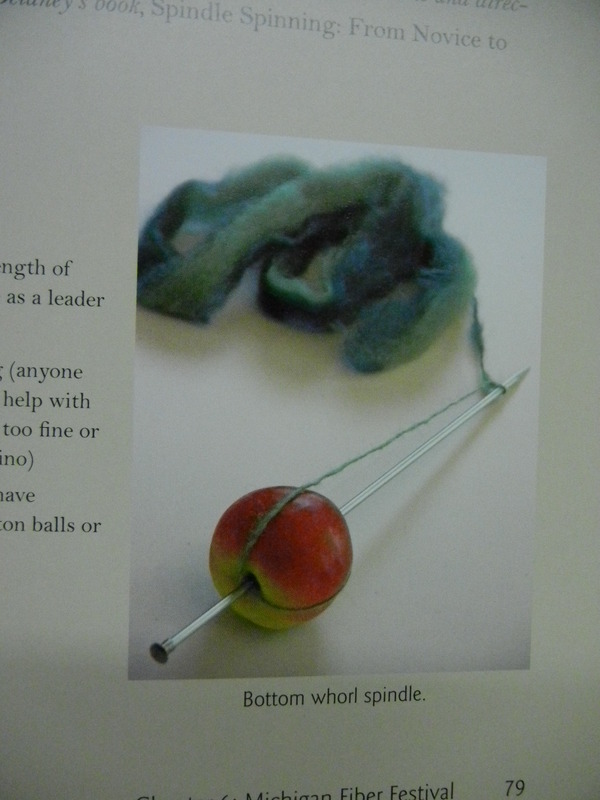 Second Mistake: ALWAYS READ YOUR CANNER INSTRUCTIONS CAREFULLY. At least seven times. While the canning process itself went well, we completely skimmed over the part of the instructions telling us to pour boiling water into the canner, not try to get the water to boil inside the canner. Eventually we corrected our mistake and in our own goofy way corrected the situation. 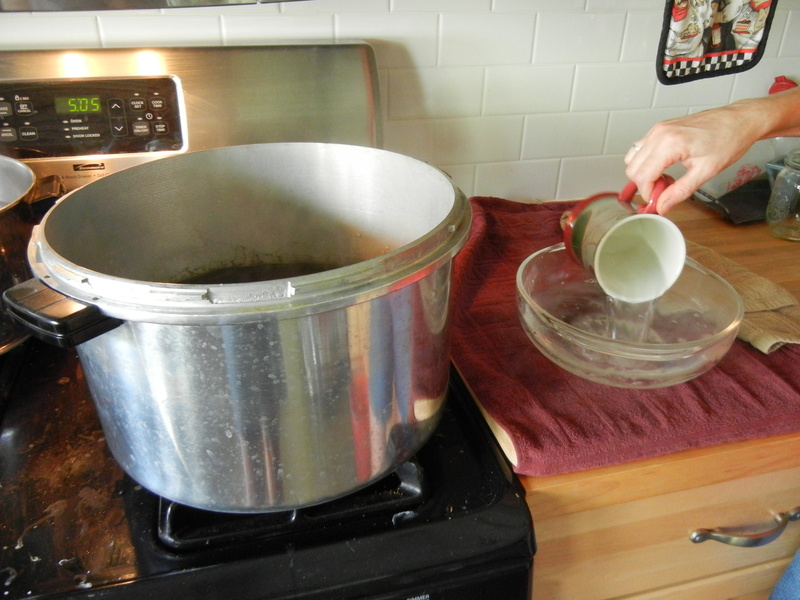 (We did use a coffee mug to transfer the almost boiling water to another pot to boil. I know there are simpler ways but we seem to want to avoid those). After that, everything went pretty smoothly. 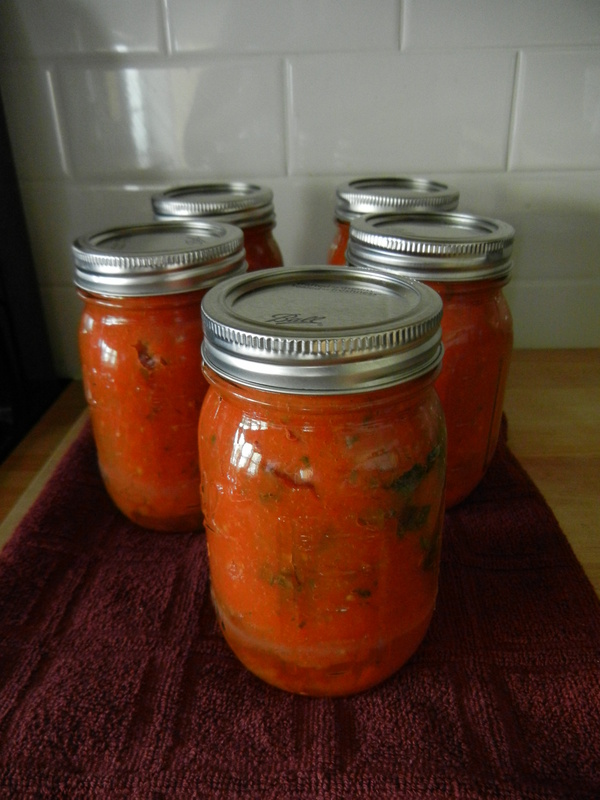 The tomatoes were cooking down with 1/4 cup of lemon juice and the jars were sterilized. We filled half of the jars with plain sauce and dropped a basil ice cube and some oregano in the other half. Another minor mistake on my part was repeatedly forgetting that the jars and tomato sauce were both incredibly hot. We loaded the jars into the canner per instructions and crossed our fingers as we watched the pressure rise. 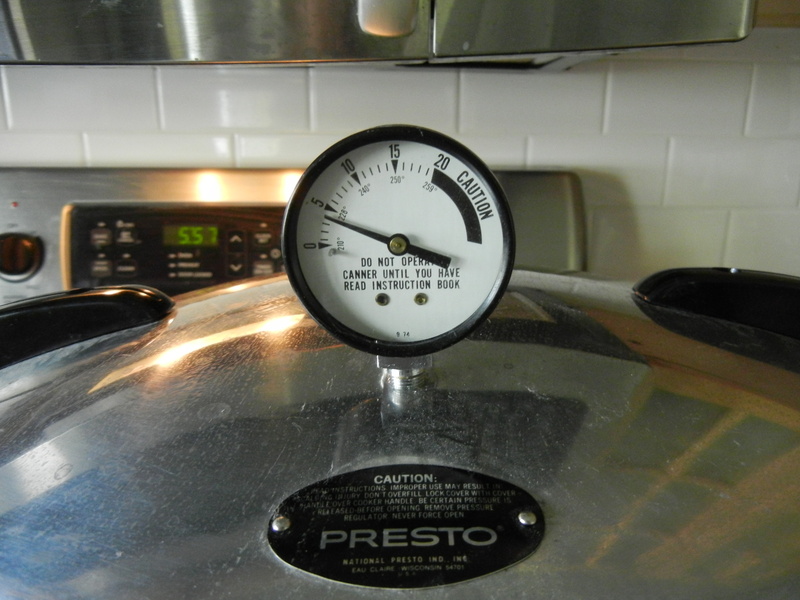 My canner requires 8 minutes at 5 lbs of pressure for the tomatoes to work properly. It was a little anticlimactic when the canner hit 5lbs and 8 minutes later I had to turn the heat off and then wait almost 6 hours for the pressure to drop and the canner to cool. But it was all worth it. Yes, we did only end up with 5 jars. I think this was mostly due to the first mistake of freezing the tomatoes whole and the amount of mass that was lost during the seeding process. But the lids are all sealed and the sauce looks great. This was the first time either of us had ever canned before and it was pretty exciting and equally nerve wracking. Another thing we decided after this process is that we’ll have to have way more than 14lbs of tomatoes for this process to be repeated. 3 hours of labor for only 5 jars of sauce was kind of a let down, even though it is incredibly satisfying to serve a meal with your own homemade and home preserved produce. There has been a dead tree in the corner of my garden that has been making me, the fence, and the neighbors nervous for awhile. The only ones who seem to enjoy it are the wood peckers, who I do apologize to in advance. So the time came for some professional removal. A local business came out and did a bang-up job getting that tree out quickly and managing to avoid all of the booby traps in my garden. 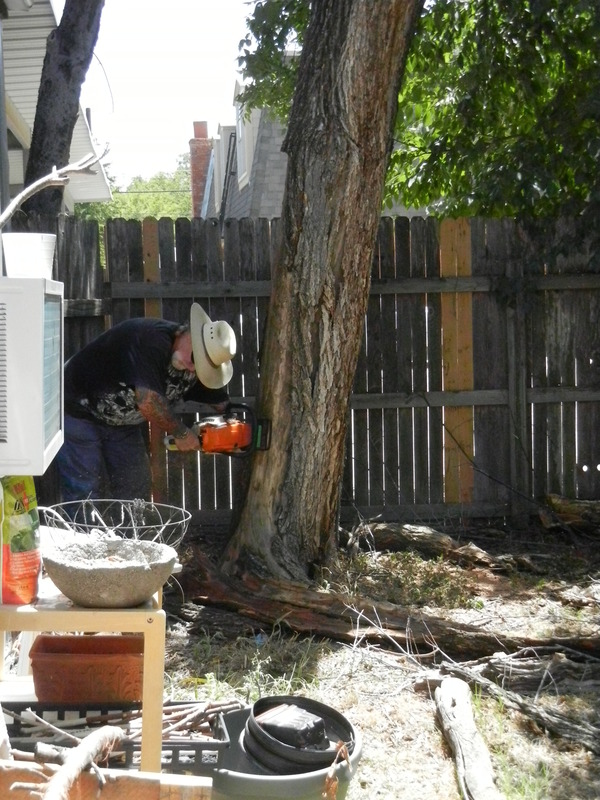 I’ve watched them do work on a neighbor’s tree (an adventure I’ll tell you about another time) and was impressed. For the main trunk, it was a pretty low-tech affair. 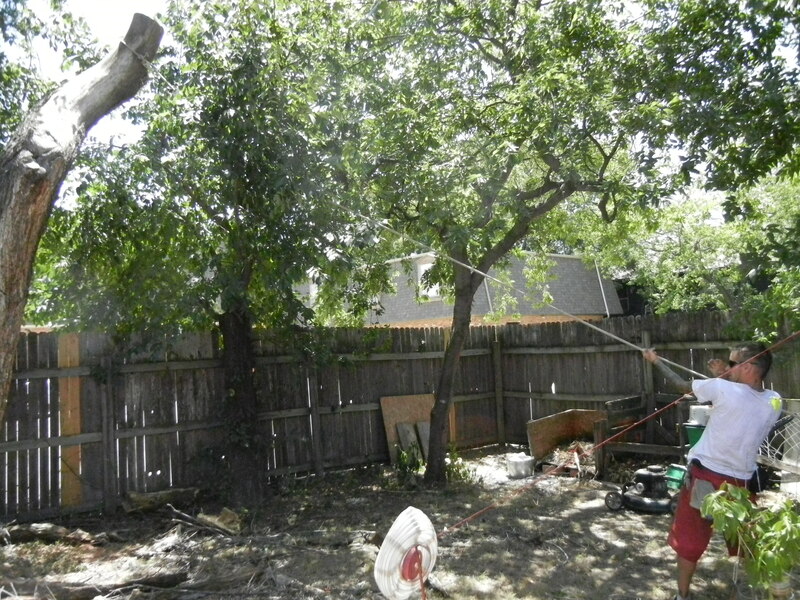 One man pulls on a rope tied to the top of the tree while another man chain saws away at the base and then boom! 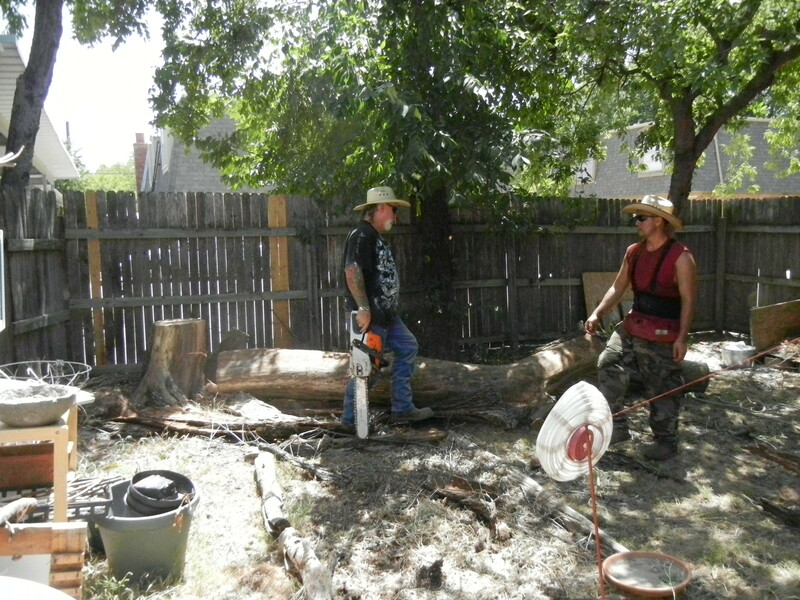 it’s down on the ground and they’re cutting it into nice 36″ tall stump sections for my rain barrels to sit up on. This part seemed simple enough but I didn’t want to be the one up in the branches of the tree tied to a rope hoping no branches would break beneath my weight. This picture just reminds me of the ugliness of a mid-summer water conservative Texas garden. Blurg. Having a dead lawn mower, broken solar lanterns, and a bunch of plastic pots doesn’t help either. But now there is a big window for light that previously meant my whole garden barely got the minimum amount of sun for full-sun requirements. They left behind the stump in the ground, it is high enough that I’m thinking it would make a pretty nice little bird bath. Or a throne. A garden throne. If you live in the area you should definitely check this out! 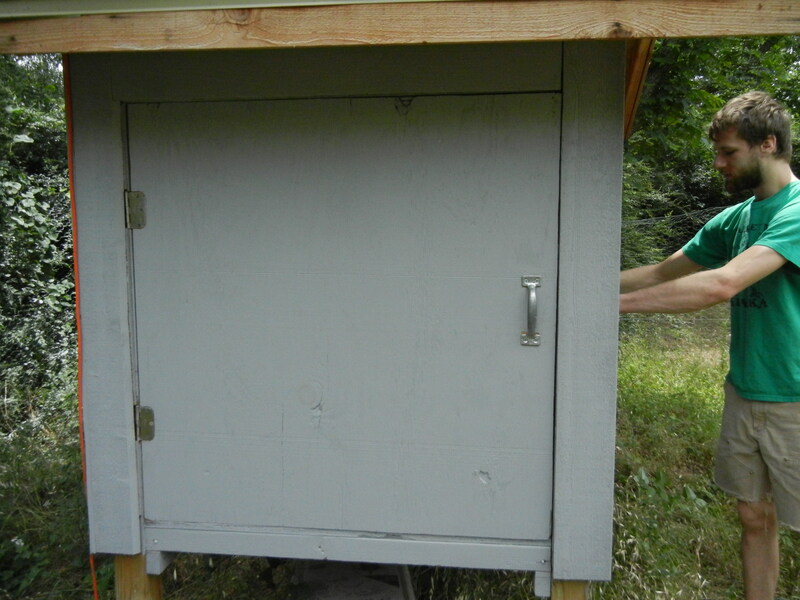 This is my friend’s chicken coop, he never ended up with chickens but the coop is a fine example. 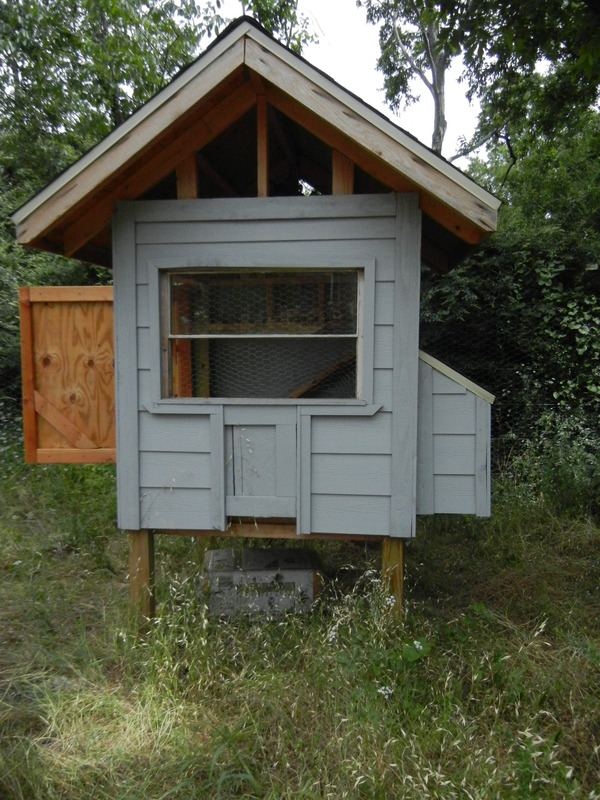 I like how high up the coop is, I imagine it would make scooping out dirty litter and collecting eggs easy on the back. 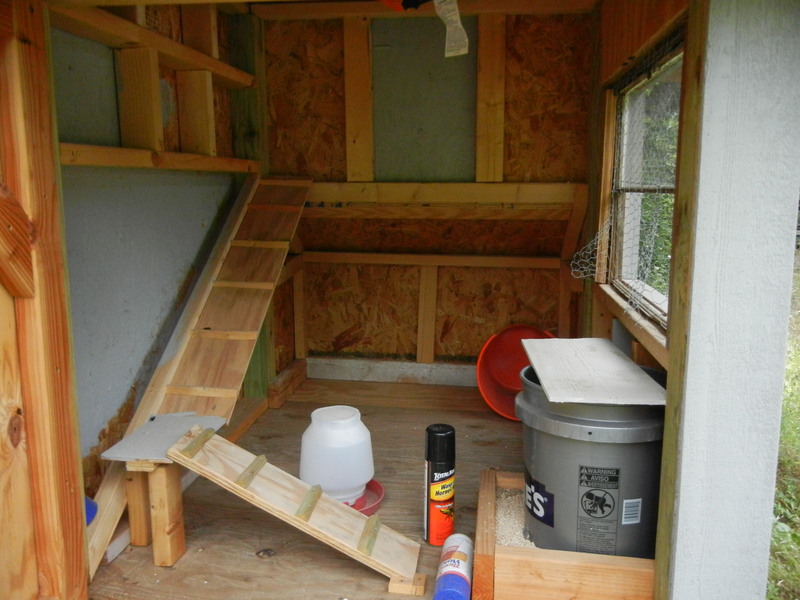 The inside of the coop has an interesting ramp – I haven’t seen many ramps on the inside of a coop for roosting. The general advise I’ve been given is to use natural branches for a roost, the different widths and the texture is easier on their feet than using a dowel rod and they like to have good air circulation so a platform isn’t idea. 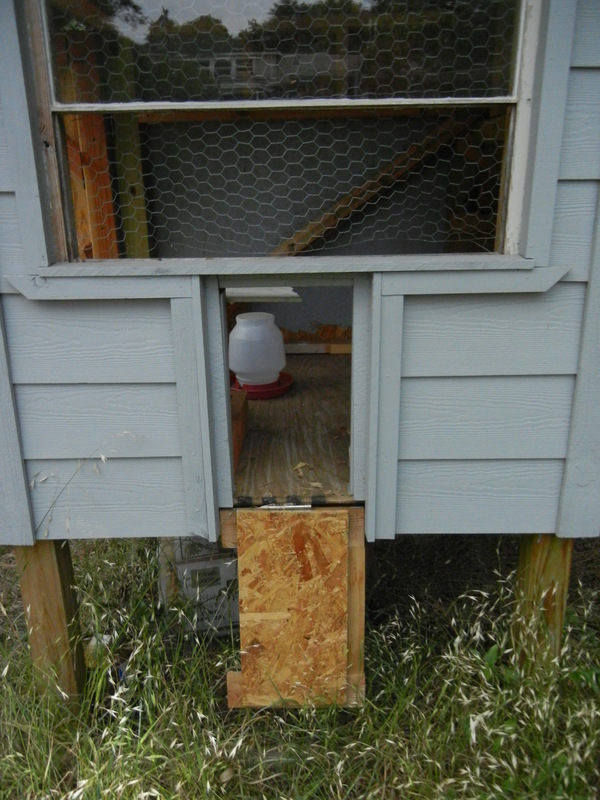 His coop has a chicken draw bridge, it wasn’t quite long enough to work but was on the road to being adjusted. I really like the big window, there is a habitat for humanity resale store that always has a lot of windows for sale. Putting in a chicken wire screen and a layer of mosquito netting will make the summer so much more pleasant. One entire side is a door, along with the height it would make cleaning very easy, allowing for easy open access. I’ve been drawing up plans for my own coop and scoping out the different construction site dumpsters around town for supplies. We are definitely a frugal family and really love to reuse found materials. These are the materials left over from building the fence. I’ve found a number of 6×6 timbers in a dumpster and some plywood sheets and tar paper in another. I’ve got a lot of high hopes for my coop and can’t wait to begin. 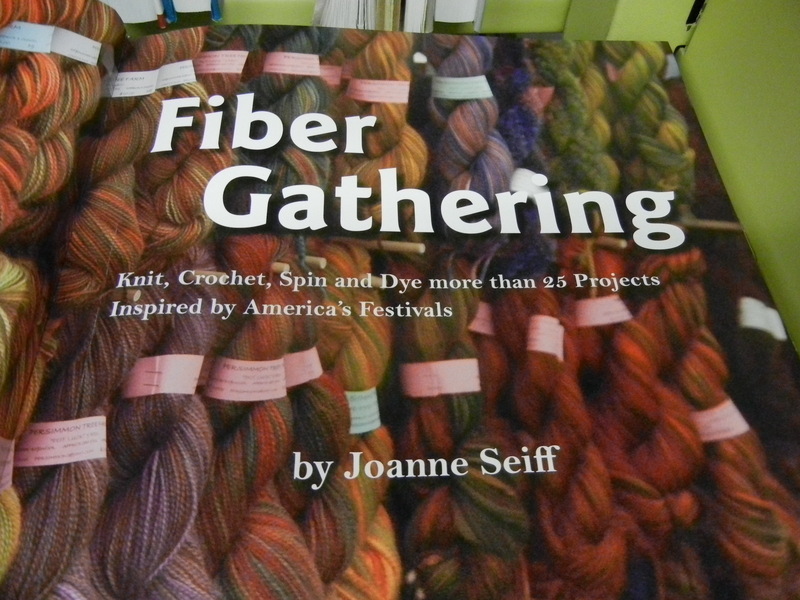 Starting grad school over the summer has put a major crunch on how often I can work on outside projects. I have planned it out and will scan those plans in and hopefully be able to include photos of the construction process along with them! 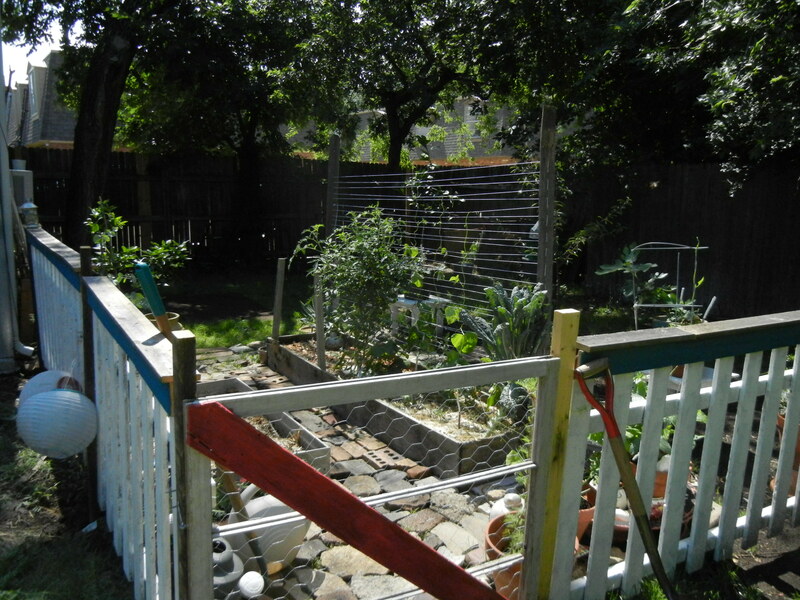 A few weekends ago, B and I decided to build a picket fence around the garden. 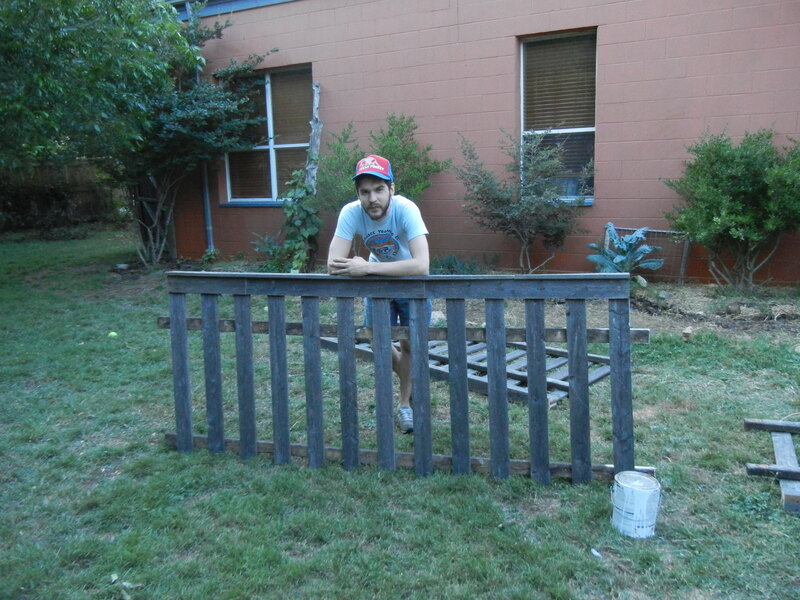 The entire fence cost me about 23 dollars – for the paint and hinges for the gate. We reused old fence panels, various found screws and hardware, and an old bag of cement that had been in the shed. Overall we’re pretty pleased with how it turned out. We used the #3 tubs as saw horses and accidentally cut through the side of one of them – the circular saw is surprisingly effective we’ve discovered. 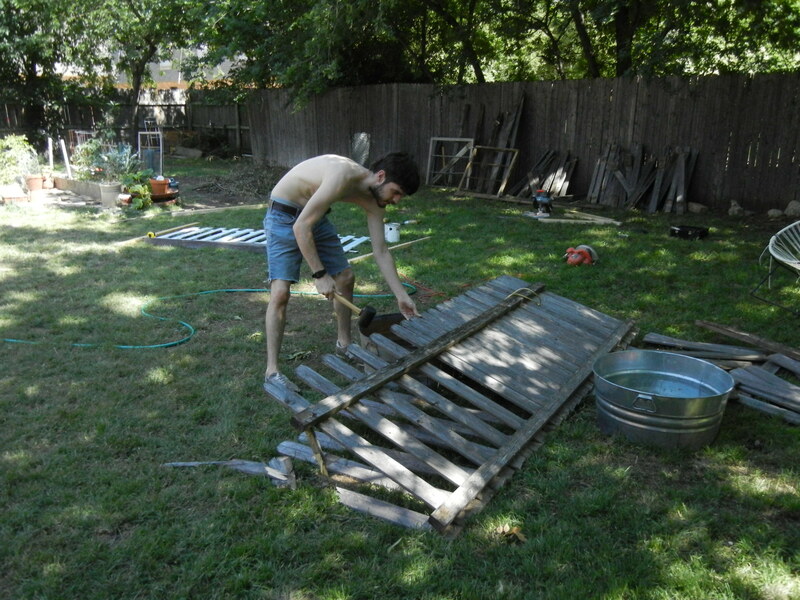 B had a good time with the rubber mallet knocking out every other fence panel. 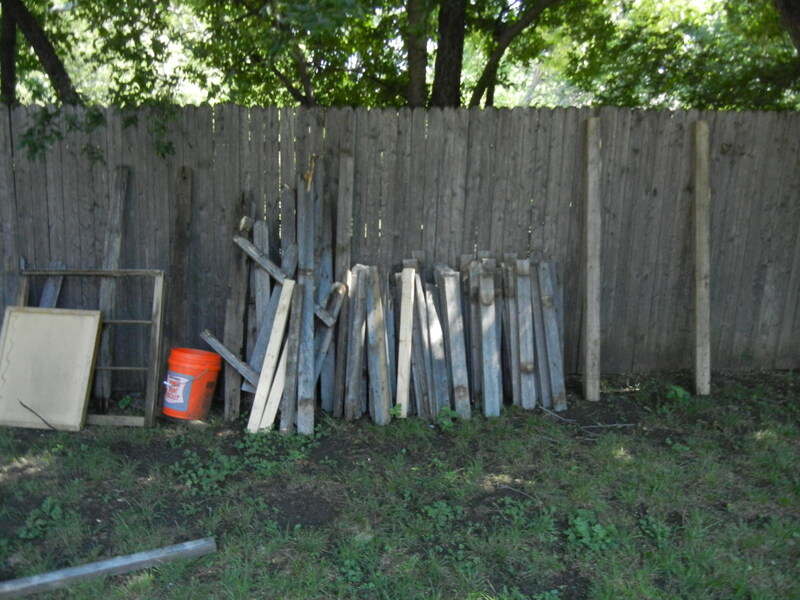 The fence hadn’t been treated for a number of years – the wood had sufficiently softened up and the nails had started to loose their grip so the panels came free pretty easily. We used longer boards to create a cap rail on the fence. Hopefully the cap rail will also help keep the panel from warping over time. Plus, if you grew up watching Tim the Tool Man Taylor like we did, having a fence you can lean on is kind of life affirming. We got the fence panels into their holes and poured the concrete. Each panel was painted looks great. The gates were made from old wooden window frames with chicken wire stretched and stapled to the back. Eventually there will be a second fence put up running down the center of the garden to separate the chicken side from the vegetable side but that won’t be for another month or two and will honestly just be chicken wire on rebar posts. I want to be able to expand or shrink the size of the chicken pen according to the garden’s needs so putting in a more permanent wooden structure wouldn’t be as accommodating. 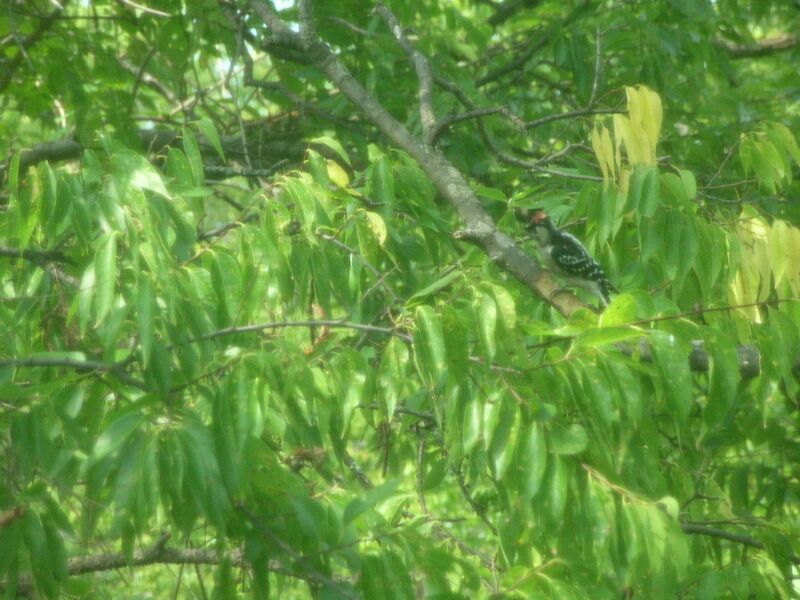 This wood pecker has raised a family for the past 2 years outside my window. I have named him Pete. 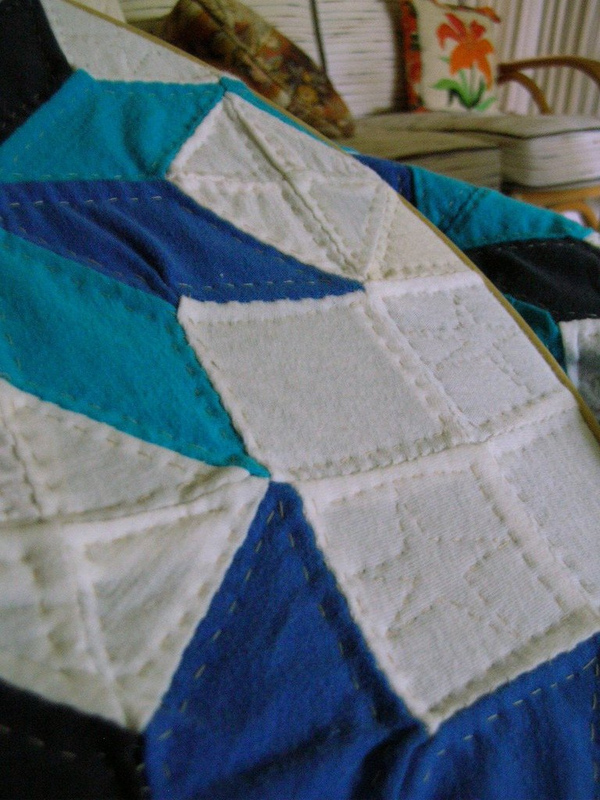 Here’s the quilt I’m working on. In retrospect, cutting small pieces out of knit material was not a great idea; keeping straight lines is next to impossible without using interfacing. Which I didn’t. So there, that’s your lesson for the day. Don’t be dumb, don’t piece quilt with knit fabrics unless you have a lot of patience and fusible interfacing.